Finding the right landscape contractor can be a challenge. 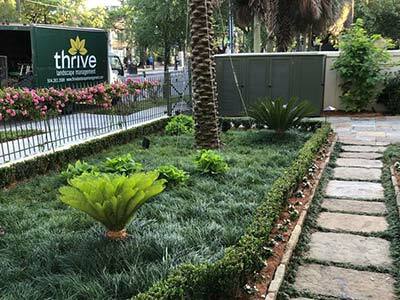 Thrive Landscape Management is a professional landscaping company that has been serving New Orleans and surrounding areas for well over a decade. We specialize in landscape design, landscaping, lawn maintenance, irrigation and lawn fertilization for residential and commercial properties. Owner and master landscape designer, Brad Shaffer, has many years of experience working as a Golf course superintendent at some of the most prestigious golf courses in New Orleans. Brad proudly brings his vast landscaping experience to homeowners and businesses alike, which guarantees your project will be designed and installed utilizing his first rate knowledge and expertise. Thrive is the area’s premier source of quality lawn care, including tree and shrub care. Our professionals will take the time to work with each client until they are completely satisfied. It is not uncommon to find Brad on the ground alongside other members of the Thrive team, working to help nurture a beautiful, thriving green lawn. Make an appointment for an on-site consultation without any obligation by phone at 504 263-3588, or use our contact form.